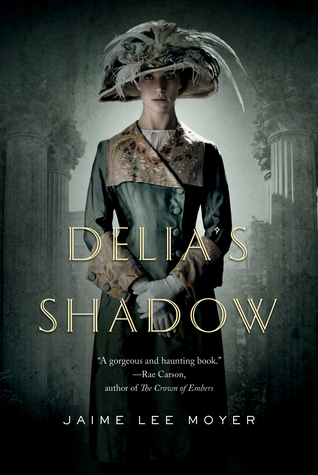 Delia’s Shadow is a wonderful combination of so many genres, it would be almost impossible to find the one that’s dominant. It’s historical, set in San Francisco, nine years after the great 1906 earthquake. It involves ghosts and spiritualists, which means it has strong urban fantasy elements. It is a murder mystery too, in which a deranged serial killer decides everyone’s fates. And finally, the strong romantic elements and dual narration mark it as paranormal romance as well. All these things combined make a fascinating book, one that will hold your attention from start to finish. It is beautifully written, although the dialogues are occasionally just a tiny bit stilted, and the characters are perfectly developed. In addition, the story is excellently paced, with not a single dull moment to burden the narrative. Although this is Jamie Lee Moyer’s debut novel, she already writes with an impressive level of maturity and self-assuredness. The story is told from two perspectives: Delia’s, in first person, and Gabe’s in third. Oddly enough, I found myself enjoying Gabe’s POV far more, probably because he showed more emotional complexity, and because his parts of the story were more eventful due to the murder investigation he was running. Delia, for her part, brought a certain calmness and unflinching honesty one can’t help but admire. As a heroine, she is easily likeable and dependable, but still somewhat of an enigma, someone I can see myself wanting to get to know better in later installments. The secondary characters don’t fall far behind. Each of them equally fascinating and well thought through. Sadie and Jack make a wonderful couple, with Sadie especially interesting and quirky. I hope there will one day be a short story with them at its center. Officer Henderson is also someone I’d very much like to get to know better, as is Annie, Sadie and Delia’s maid and confidante. The ghosts in the story were perhaps not as scary as they could have been, but that was not their purpose at all. They were a constant presence in Delia’s life, there with a purpose – to help catch the man who killed them all, a serial killer active for over 30 years. Moyer is excellent at building nail-biting tension, and her killer does not disappoint; he is intelligent, vicious, and completely sociopathic. Two more books about Delia Martin were announced. They’re titled A BARRICADE IN HELL and AGAINST A BRIGHTENING SKY and scheduled to be published in 2014 and 2015, respectively. I’m very much looking forward to both. I've been planning to read this since I saw it on Melissa's blog, and the fact that you also loved it is even more reason for me to speed that plan up. Delia sounds like a wonderful heroine I'd like to get to know more, but I'm more eager to meet Gabe and Sadie now. I adore San Francisco and miss it terribly, so any book set there (especially around the earthquake time period) is immediately in my good graces. Can't wait to check this out. Beautiful review! I've briefly seen this around, but now with your seal of approval I'll be scampering to get my hands on this for sure. It sounds exactly like my kind of book! ;) Wonderful review, Maja! Oooh gosties! I've seen this book around on Goodreads a few times but never really paid any attention to it. I've seen this one around and was intrigued but, after reading your review, I'm even more drawn to it. I do love the time frame and, well, you know me and UF. Gabe sounds like a character I need to get to know. I love books that have a blend of genres and historical and paranormal are two of my favorites, so I will definitely be checking it out. It sounds like for a debut book this was very well-written and the characters sound like they have a lot depth. You know how much I appreciate that in my books. Thank you for the lovely review, Maja. I'll be buying this one soon. great review. I have to be honest. the cover has deterred me from this book but I have seen a couple of reviews and all were so good. This sounds like a fantastic read! Great review Maja. For some reason, even though the cover is very pretty, it slightly creeps me out too and I have no idea why! I've got my eye on this one for quite some time and after reading nothing but great reviews, I'm really excited to read it. I wasn't aware of the dual narration but that's an added bonus. My mother in law absolutely loved this one too Maja! I think I need to read it now that she's done, it sounds fantastic. I kind of like that Delia's a bit of an enigma, I enjoy characters that make me dig a bit to find anything out about them, particularly if there's a series and I know I'm going to learn little pieces of the with each book:) Gorgeous review as usual!!! Oh I'm glad you liked it, this was was really good, and I confess I'm really curious for more now. I tried and tried to get this one for Wicked but I don't know the publisher never got back to me on this one. I have it for review and I cannot wait to dig in. I am so happy to hear you loved it! I'm glad you enjoyed this one. I liked it too. I had a tad bit of trouble getting into the dual perspective. I love the cover and overall story arc. Maja, I confess I only read your first paragraph and went SQUEE. I have this coming up for review, and honestly cannot wait to read it. I've seen that cover before (so pretty! ), but yours is the first review I'm come across. And color me intrigued. I haven't read many books about mediums, but I've tended to like those that I have. And with the possible exception of paranormal romance, all of the other genres you've listed are ones that I enjoy. I'll definitely have to keep this one in mind. Lovely review, Maja! I've read one other review for this one and immediately added it to my amazon wish list. I love the mix of genres, and I think it sounds wonderful. I'm glad that you liked it as well. I have been very curious about this since it started showing up in mailboxes. I'm so glad to hear that it really is good! It sounds like a must read for me! This one sounds very cool. Glad you enjoyed it! I love historicals with ghosts. Now with your review and with Kristen's... I feel like I need to give this book a try no matter what! Great review! Oooohhh!! This wasn't on my radar before and I have no clue why - it sounds fantastic! The mix of paranormal, historical and mystery elements weaved together sound like my cup of tea. Great review as always! I'm looking forward to reading this one, Maja. I love the setting and the ghost story(ies) attached to it.